Winter. Comfort Food. I decided to drop some beef short ribs in the slow cooker for a quick and easy Sunday supper, and scoured the internet for recipes. I came up with one, and decided to do a little tweaking. Buy your short ribs. Don’t trim them. 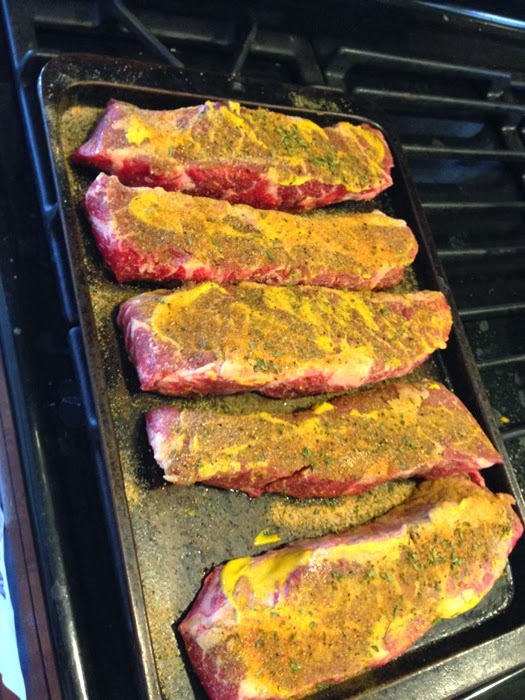 Give them a light coat of yellow mustard, and then season with a good bbq rub, either store bought or make your own. There are tons of recipes online. Place in fridge for as little as an hour, or up to overnight. Remove from fridge and brown the ribs on all sides. 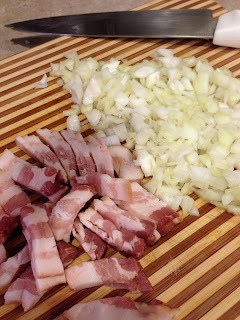 Place the ribs in the slow cooker, top with chopped onions, and then the rest of the combined ingredients. Cover with a lid and set your slow cooker for 6 hours. Run errands or grab a beer. After 6 hours, remove ribs from slow cooker and place on baking sheet. Coat with some sauce from slow cooker and place in 375 degree oven for 15 minutes. This step caramelizes the sauce and gives the ribs some extra flavor. Remove fat from the rest of the sauce (still in slow cooker), and then pour back in to keep warm. I have one of those grease separators, which is really an indispensable kitchen gadget! 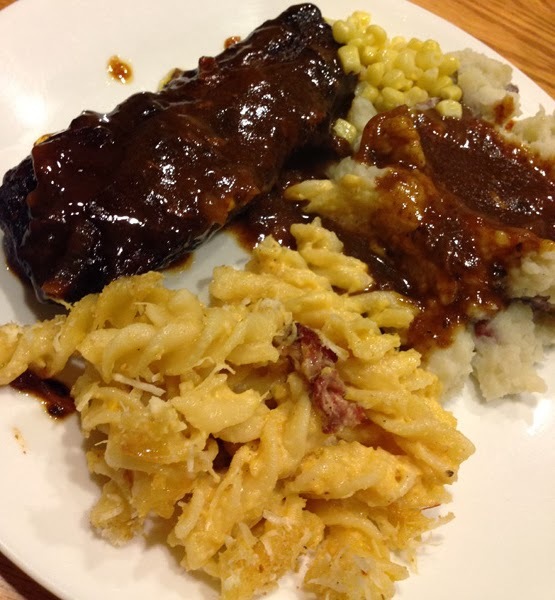 Pull ribs from oven, plate, ladle sauce to taste. Add your sides and you are done. Try mashed potatoes and something green. Kid test: They loved it. Buddy's --even when you don't feel like pizza! Everyone knows that Buddy’s makes Detroit’s best pizza. It’s a Motown original, dating back 67 years. I recently had the pleasure stopping at the original Buddy’s, near six mile and Conant, for something out of the ordinary. Straying from my comfort zone, I explored other offerings off the menu and discovered something special. It’s in Buddy’s made from scratch meatballs! This is an appetizer meant for sharing, but you could also experience this as a main course lunch or dinner. 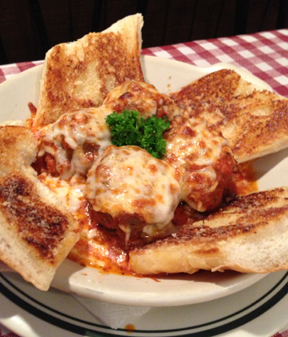 Four meatballs tossed in marinara or meat sauce, topped with melty mozzarella and served up with grilled garlic toast. Divine. Buddy’s meatballs are made from fresh ground beef and veal, and taste like, well, BEEF! There’s no mistaking what these are. It’s not a bunch of filler or chemicals or turkey parts, etc. Buddy’s chefs knock these out fresh daily. If they served this up with some fresh warm pizza bread, I’d probably just move in. Chicken tenders. That ubiquitous food which kids everywhere seem to inhale on a daily basis. Buddy’s makes these good enough for adults—fresh strips of white meat chicken dipped in buttermilk and then tossed in seasoned flour and fried in canola oil. Another item off the app menu, which can easily become a meal. Buddy’s minestrone is thick like a chili. Some places serve minestrone that’s disappointingly watery, but this is thick, and choc full of tomatoes, carrots, zucchini and pasta. All Buddy’s soups are homemade, down to the dumplings in the chicken and dumpling soup. Buddy’s takes a generous helping of seasoned thick wedgecut fries and layers them with a blend of mozzarella and cheddar, and bacon-- because everything is truly better with bacon. This is a hearty side dish that you’ll want to share. Buddy’s makes several baked pastas, including mostaccioli, cheese or spinach lasagna, mac and cheese, and two types of ravioli. Choose pasta pillows stuffed with a creamy ricotta cheese or hearty meat filling, topped with marinara or meat sauce, and then baked with fresh mozzarella. The pasta is just past al dente, and the filling, like everything else, made from scratch. Buddy's meat sauce is made with fresh ground beef, veal and pork--for those who need to know. So there’s the travel log of Buddy’s non-pizza items. Comfort food, made by chefs, and served up by staff who have been around for the long haul. At the original Buddy’s, General Manager Dennis Kot counts 37 years with the company, starting out as a pizza cook! Several waitresses and kitchen staffers have been at this location for 10 or 20 years. In the turnover prone restaurant industry, this kind of longevity speaks volumes about management and ownership. For more about Buddy’s, find them on the web and Twitter. We were thinking about what to make for a quick and easy dinner, when suddenly a recipe came via email from Brys Estate. Brys, as you should know, is a fantastic winery up on Old Mission Peninsula, just a short drive from Traverse City. Their pinot noir, cab franc/merlot, and ‘Signature Red’ are outstanding. But I digress. 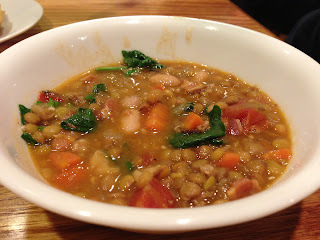 Brys' recipe for 'Lentil Soup with Spinach, Chorizo and Bacon' provides a winter warm up dish, with just a little heat. 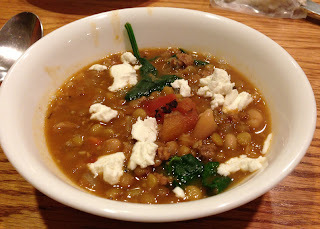 The chorizo sausage fits perfectly with the lentils and fire roasted tomatoes. Bacon—everything tastes better with bacon. The crumbled goat cheese garnish adds a rich creaminess. If you don't like goat cheese, reconsider. I also toyed with adding some avocado slices—next bowl. 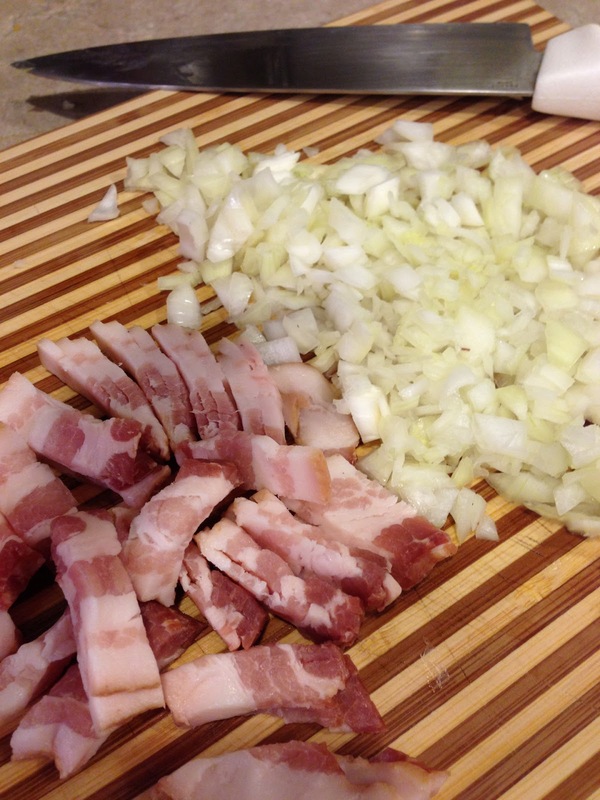 In a large soup pot, fry the bacon over medium high heat for about 4 minutes until it begins to crisp up. Add the ground chorizo and saute 3-5 minutes longer until the chorizo is browned. Next add in the chopped onion and carrots. Saute another 5 minutes until the onions begin to soften. Toss in the garlic and saute about a minute or so until the garlic is fragrant. Add the lentils, cannellini beans, can of tomatoes, and chicken stock. 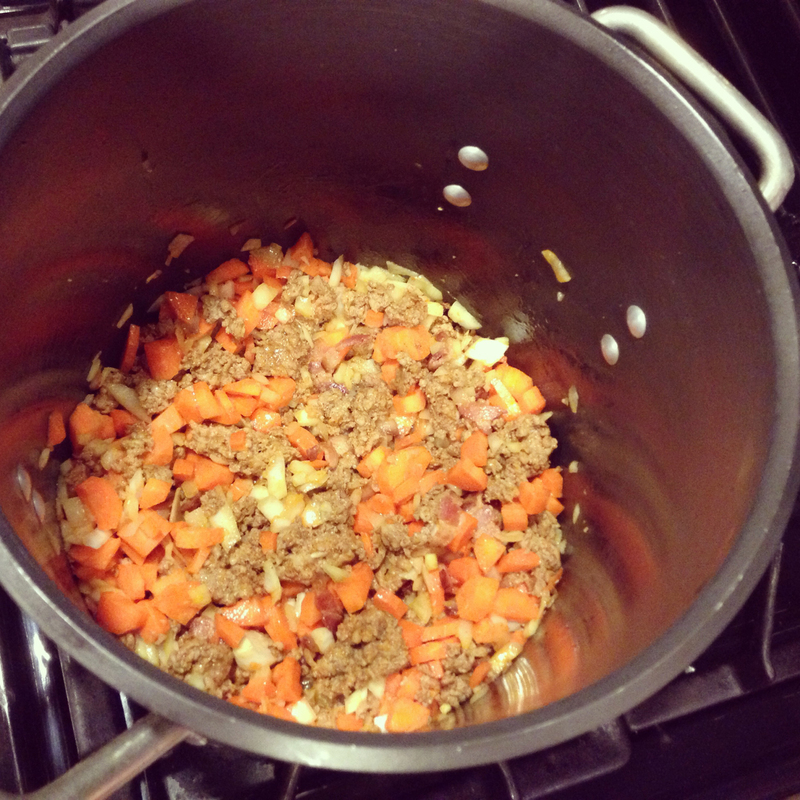 Bring to a boil, then reduce heat to low, cover and simmer for 45 minutes until the lentils have softened. Stir in the salt and pepper gradually, after tasting the soup. I didn’t add any salt, but you might want to. Before serving, turn off the heat, add the spinach and stir until the spinach has just wilted. Serve the soup in large bowls with crusty bread, and top each bowl with crumbled goat cheese. Find this recipe and more on the Brys Estate Winery website. Brys is on twitter too! When I spotted this recipe in the Brys Estate Winery newsletter, I knew we had to give it a try. I love a good potato leek soup, which made this potato leek gratin recipe sound so good. The recipe, created by Patrick Brys, is pretty straight forward. We served it for Christmas dinner with roasted tenderloin. Instead of Gruyere, we used a blend of fresh grated Jarlsberg and Fontina cheeses. In a large mixing bowl, add the sliced potatoes, cream, salt, pepper and about 2 1/2 cups of the Gruyere. Mix well, set aside. In a medium saute pan, add the butter, olive oil and sliced leeks and saute over medium heat until the leeks begin to soften, about 4-5 minutes. Transfer the leeks to the mixing bowl with the potatoes. Mix well. Butter the inside of your favorite casserole dish. Add the potato mixture to the dish and use a rubber spatula to smooth out the top. Sprinkle the remaining 1/2 cup of cheese on top of the gratin and place it in the oven. Bake for about 1 hour and 15 minutes until the top is golden brown and the potatoes are well cooked. Let set for 15-20 minutes before serving to allow it to firm up a bit before slicing. NOTE: This gratin can be cooked ahead days in advance and simply reheated at 350 degrees for about 30 minutes. We really enjoy the wines of Brys Estate, located on Old Mission Peninsula, just a short drive from Traverse City. Their Sauvignon Blanc pairs nicely with fresh seafood. We served Brys' Pinot Noir with a Smoked Turkey on Thanksgiving. And the Cab Franc and Signature Red both stand up to your favorite meat dish. 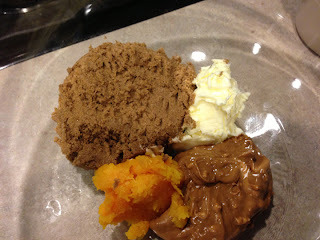 Find this recipe and more here, on the Brys Estate Winery web page. The fine folks at Cooking Matters Michigan are at it again—asking us to make over traditional holiday fare, into something healthy. Well, why not?! It’s a national program housed locally at Gleaners Community Food Bank. Cooking Matters is part of the Share our Strength program, and offers classes in cooking, nutrition and making healthy choices for low-income adults and teens. A volunteer corps of chefs, dietitians and everyday people with an interest in giving back take part in this educational program that makes a huge difference for some people who could really use a little extra help. Make over a typically unhealthy/favorite holiday meal using three ‘secret ingredients’. Incorporate healthy cooking/baking techniques and nutritious ingredients while maintaining the essence of the dish. 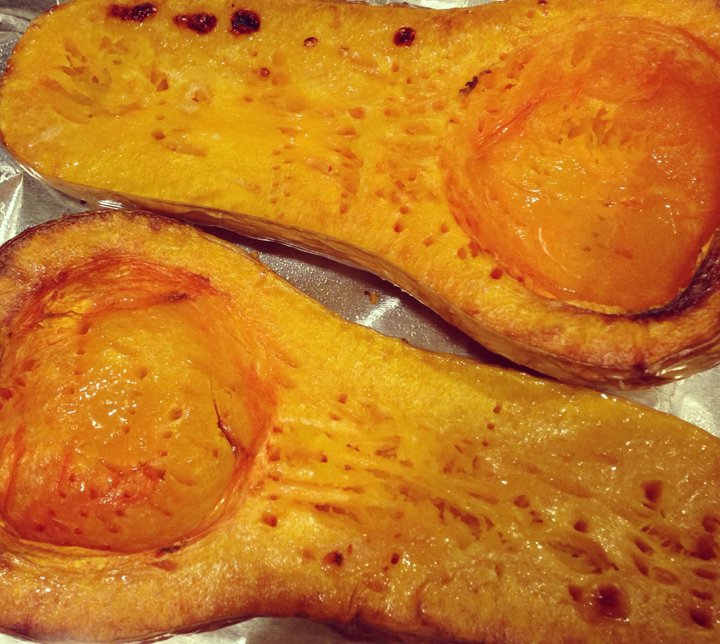 The night before, I roasted a halved butternut squash for two hours at 375 degrees. No seasoning, just some cooking spray. I scooped out the insides and refrigerated. 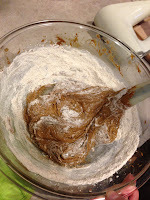 Add in one egg and continue creaming until all mixed together. 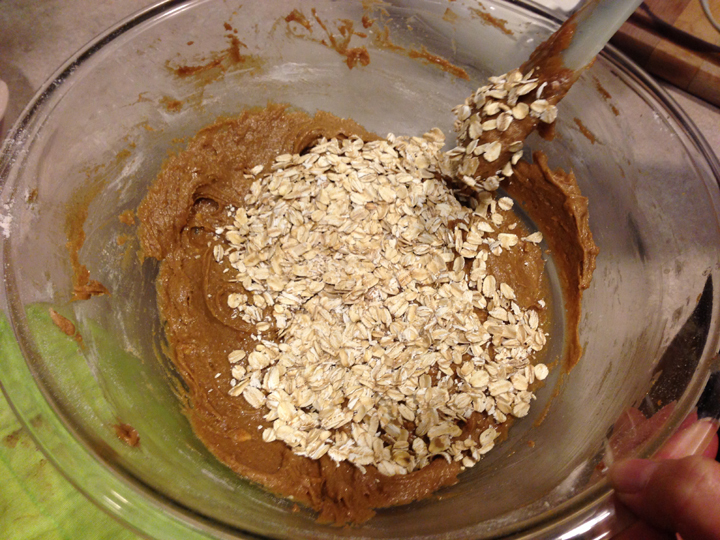 Add 1/2 cup oats until just combined. 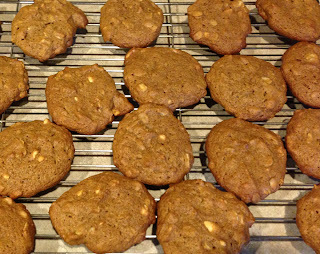 Drop teaspoon size dollops of batter onto an ungreased cookie sheet and place in pre-heated 350 degree oven. Bake 13 minutes and remove to wire rack. Don’t overbake! 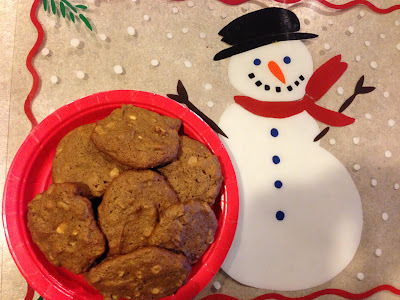 These cookies turned out really well. 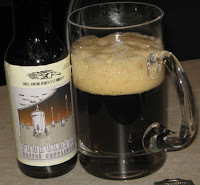 You get the distinct peanut butter flavor and plenty of sweetness from the dark brown sugar. By replacing half the butter or margarine with cooked squash, you are trimming saturated and/or transfat while adding veggies. 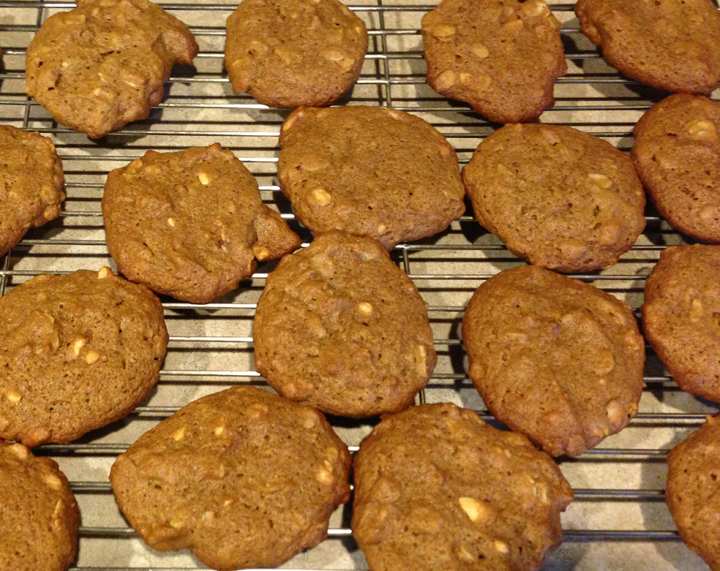 Incorporating whole wheat flour adds a little denseness, and the nutty flavor pairs well with the peanut butter. The oatmeal adds protein, fiber and good taste too. But what about the kid test? Our 12-yr-old son saw them and asked if he could have one. I didn’t tell him about the secret ingredient. He gobbled one down and asked if he could have another. He then took three and poured a glass of milk. Win! For more information on Cooking Matters Michigan, visit their blog, and find them on Facebook and Twitter. Tired of holiday leftovers yet? 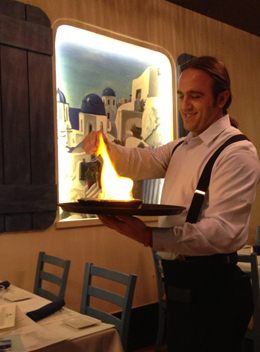 Head on down to Greektown for a new dining spot featuring excellent food, friendly service, and a bright and welcoming atmosphere. Monroe street has long been known for authentic Greek food— metro Detroiters have been flocking down there for decades. But several smaller venues have gone, prompting the owners to close down popular Mosaic and re-open as a new modern Greek restaurant with classic touches and an exciting menu. · Saganaki Feta – Warm and crispy feta wrapped in phyllo dough, drizzled with Greek honey, topped with sesame seeds. This is one of the more interesting appetizers I’ve had in a while. It could easily be listed on the dessert menu. Slightly sweet, creamy and delicious. · Octopodaki Skaras– Grilled marinated octopus in a balsamic reduction sauce and caramelized onions. Slightly fishy, nice and tender. · J.P.’s Lamb Chops – Marinated in a Mediterranean mix of olive oil with rice or potato and vegetable. Good portions, grilled to perfection. · Arni Kleftiko – Lamb baked with potatoes, carrots and zucchini, served in a parchment ‘purse’. The lamb is tender and still pink inside. Layers of flavors highlight this dish. · Solomos – Pan-seared salmon with asparagus and rice, topped with an orange vodka sauce. · Lavraki – Classick Greek presentation of whole fish, baked in sea salt, served with a mixture of oil & lemon, rice or potato and vegetable. I’m going for this one on my next visit. For dessert, there's two kinds of baklava and a chocolate lava cake. All highly recommended. The entire look and feel of the restaurant has been redesigned to make customers feel like they have been transplanted to Greek island. Grecian shutters, light colors, open windows (in season) and a locally constructed boat hull add to the atmosphere. On Monroe Street, the wall was replaced with floor-to-ceiling windows and French-style accordion doors. A patio will be installed in the spring. 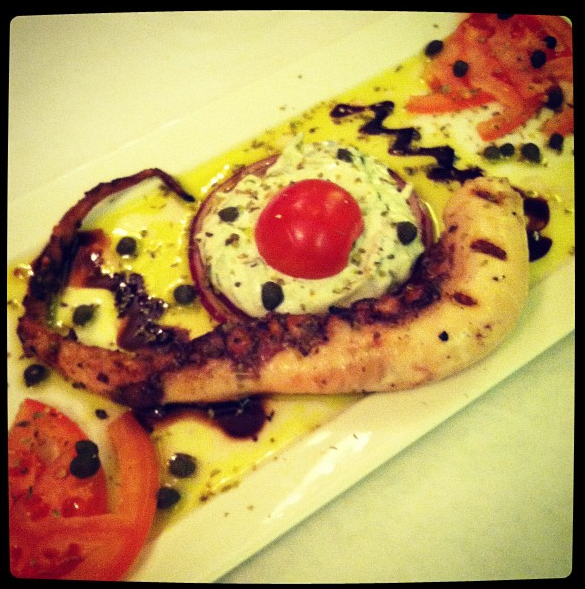 Santorini Estiatorio is located in the heart of Greektown at 501 Monroe St. in Detroit. For more information and updates, find them on Facebook. Have you ever wanted to say “what the hell” and have a beer for breakfast? Maybe it’s the weekend and you’re cooking up brunch. Or maybe you’re a little hung over from the night before and figure the old “hair of the dog” might help. Well here’s a few brews that lend themselves to the morning meal! We’ve got all the important food groups covered here. 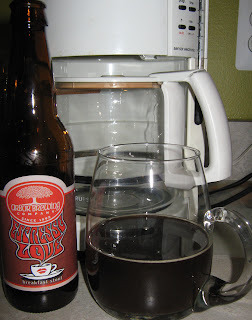 Take an oatmeal stout, add in some Sumatra and Kona coffees, and a little bitter chocolate. What more could you ask for– other than some pancakes and bacon to go with. And clocking in at 8.3% ABV, this is a serious brew that should be consumed with caution. 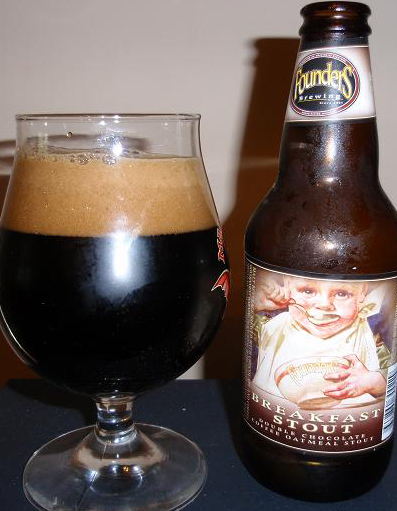 I remember my first Founder’s Breakfast Stout. It was on tap at Slow's BBQ, which is already somewhat of a religious experience. Starting the evening w/ this beer—bliss! 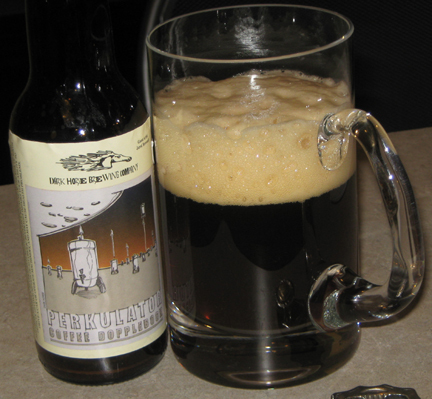 FBS has an intense coffee nose, followed by coffee, roasted malt and chocolate flavors, and a smooth creamy finish. This is what all breakfast stouts aspire to be. Taking it up a notch? 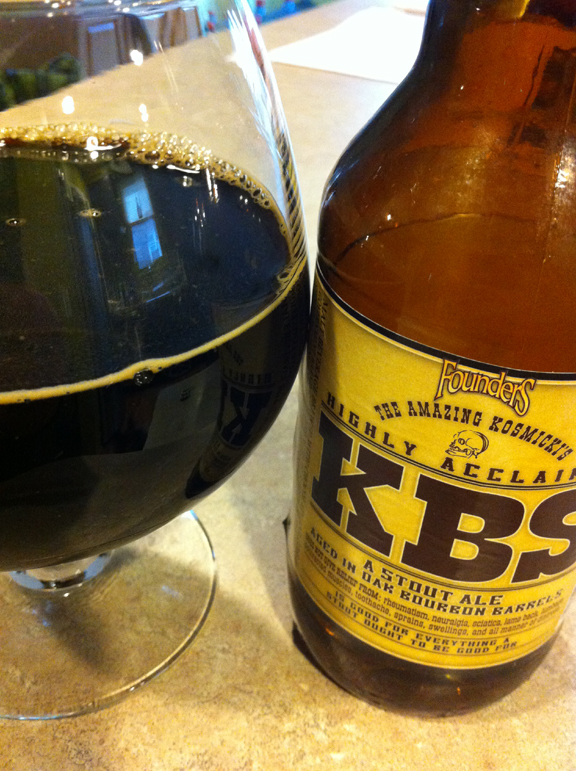 Go for a Kentucky Breakfast Stout--if you can get your hands on a couple bottles. All the goodness of a Founder's Breakfast Stout, and then it's aged in Bourbon barrels. 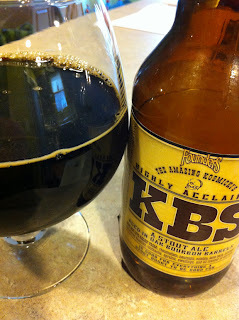 Disclaimer—this blog does not advocate drinking beer at breakfast, and takes no responsibility for what might occur, should you drink a few of these and head to the office. Please drink responsibly!